“Have I mentioned to you that I have a not-insubstantial fear of heights?” I wrote my editor at this site when he assigned me to review this film. His silence in response was eloquent albeit still open to interpretation. Honnold, now in his early 30s, is a fit, wiry fellow with a disarming smile who is not exclusively a free solo climber. But he likes a challenge, and for years has seen the formation known as El Capitan, in Yosemite National Park, as his own free solo white whale. The movie is as much about whether he wants his attempted ascent to be filmed as it is about his intense preparation for that ascent. There’s an interesting Schrodinger’s Cat subtext that gathers around the movie’s narrative, as Honnold discusses with filmmaker Chin where the latter’s camera people—each one a seasoned and awestruck-by-Honnold climber—ought to be positioned in order to present the least amount of distraction for Honnold. The challenge also represents a philosophical puzzle for the climber. Everything he’s about has him doing the climb strictly for the existential achievement of doing the climb. Doing the climb while observed by film cameras is a whole other issue, and one he’s considerably troubled by. I know what you’re thinking: THAT’S what he’s troubled by? Not by the prospect of climbing a spectacularly high rock face without a rope? Well, as you might have guessed, Honnold is a very unusual guy. At the time this film started shooting, he lived in a van. A pretty tricked-out van, but a van nonetheless. Archival footage and narration limns a childhood that was unusual but not overly so, with the signal event being a discovery of climbing. His subsequent pursuit of the activity brought him fame, and some money, which he’s commendably channeled into a nonprofit company that brings technology to impoverished sections of the world. But in terms of a social life, not too much. The movie shows him navigating his first seemingly sustainable romantic relationship, with Sanni McCandless, an intrepid young woman who nevertheless worries about him; and Alex starts getting the feeling that her worries are throwing him off his game. As for his own worries: at one point in the film he submits to an MRI, which reveals that his amygdala—the portion of the brain responsible for the fear impulse—doesn’t show a lot of activity. If any. Well, if you’ve got a non-functional amygdala, might as well put it to good use. Which is not to say that Honnold is incautious. 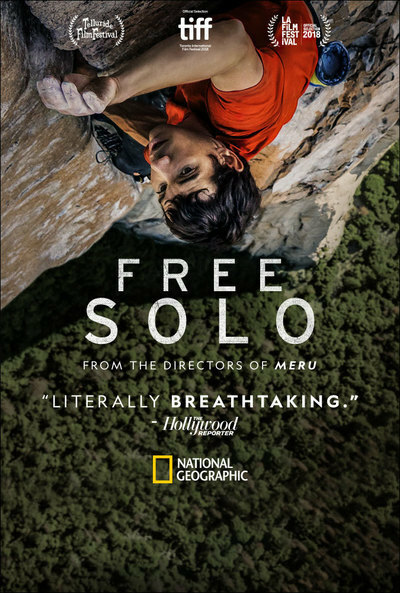 What’s required for a free solo climb is an intimate knowledge of the surface you intend to climb, and Honnold, after multiple climbs using ropes, fills notebooks with descriptions of specific “pitches” on the rock, which he then memorizes, along with the moves necessary to navigate them. The movie does a superb job showing the mental and physical preparation and effort required. And for all that, doubt and a little bit of fear persist, souring Honnold’s first try at a climb. By the time he preps for his second whack at it, the viewer has a pretty good idea that the guy is going to make it. Which doesn’t make the magnificent final fifteen minutes of the movie any less suspenseful. Chin and Vasarhelyi have done such a good job laying out some of El Capitan’s specific challenges for the viewer that they become resonant beats in a mini-story arc. It’s scary and exhilarating stuff.